Suzette Oyeku, MD, MPH, is a general pediatrician and health services researcher. She is Associate Division Chief for Academic Affairs within the division of general pediatrics at CHAM. In this capacity, she oversees a broad array of activities, including stewardship of divisional research initiatives and faculty development activities. 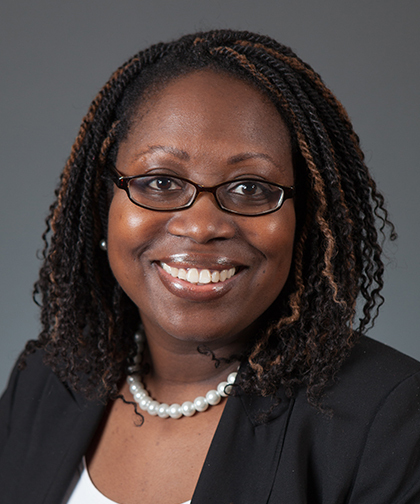 In addition to general pediatrics, Dr. Oyeku has particular interest in Quality Improvement, sickle cell disease, health care disparities and faculty development and community education activities. She focuses on reducing inequities in health and improving quality of care for ethnically diverse populations who suffer from chronic illness. On a regional and national level, Dr. Oyeku has also served on advisory panels and committees focused on sickle cell disease and improving healthcare quality for children and adolescents. She currently serves as the Treasurer for the Academic Pediatrics Association. She also is a liaison to the American Academy of Pediatrics Council on Quality Improvement and Patient Safety. In addition to her professional activities, she is committed to an ongoing effort to enhance health education and promotion through her local church, which also informs health programming for other churches. Dr. Oyeku received her MD from NYU School of Medicine and her MPH from the Harvard T.H. Chan School of Public Health. She completed her residency at the Boston Combined Residency Program in Pediatrics, Department of Medicine, Boston Children's Hospital and Department of Pediatrics, Boston Medical Center. She also completed a Harvard Pediatric Health Services Research Fellowship Program at Boston Children's Hospital. Dr. Oyeku was a recipient of the Dean’s Award for Community Service from Harvard Medical School.